It's time for another Google Narrative, highlighting a Google AJAX Search API developer, Chirag Mehta. Chirag is developer in St. Petersburg, Florida who got started coding on a ZX Spectrum almost twenty years ago and has dabbled in graphics, animation, databases, ERP/CRMs, and productivity apps. 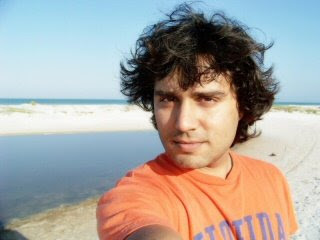 He is currently working as an IT director and is in a graduate program in Technology Management at University of Tampa. He co-founded Chime.TV in 2007 and Sched.org in 2008. His favorite area of development is simple web utilities. Chirag and his wife love animals and when he's not coding or studying, he is either kayaking or playing with their pets.Q: Tell me about how you used Google AJAX Search API for Wiki Search and Drop Search and how you came up with the ideas. A: My wife's currently in medical school and constantly doing searches online for medical terms. Wikipedia offered tons of information but she found their search feature to be insufficient for her needs. 90% of the time, you have no idea what you're searching for or guessing at it - it doesn't do anything to help you out. I wanted to help my wife have a faster, more dynamic experience so I brainstormed how to build a XML-type of search feature, similar to Google Search Suggest, while you were on Wikipedia. (It also helped that I'd always found Wikipedia interesting and researched databases that used it as a source of information.) That also led me to start looking at implementation options and of them all, AJAX Search seemed the easiest to integrate in a quick manner. Instead of taking two weeks to research documentation and then implement with other APIs, it took about an hour with Google AJAX Search. Also, I had worked with many Google APIs on other projects before, but the Google AJAX API was the best. The speed was amazing! The idea for creating Drop Search came soon after fiddling with more Google AJAX search documentation. My implementation gives the everyday person without a programming background the ability to add a customized search engine to any site. It's code that you can copy and paste into your application and customize for your own needs using CSS, which I did for my own blog. A friend of mine at Rutgers University saw what I did and wanted the same type of feature for their professional development site so I released the code that I created to everyone on my projects page. Q: Describe any obstacles you had with implementation. A: There were none. Actually I had a couple of questions at first but I looked at the forums and got the answer fairly quickly. They were around legal issues - Am I allowed to query as I type? Is it legal that I'm doing this with Wiki search? I wish legal terms were much clearer on Google Code. I had some assumptions, only to find out they were recommendations rather than requirements. I do have to say that the documentation on Google Code is perfect. One minute you're reading documentation, the next you're in the forums reading about other developers' experiences. Help pages are broken down into every bit so it makes coding a cakewalk. It's a really good experience compared to other sites. Q: Can you provide any tips for other developers using Google AJAX Search API? A: Before you try to build something, find out if Google already has. Google will build 98% of your needs on the back end, leaving you 2% of the work to focus on making your user interface exactly what you need for the front end. Also, another tip... listen to your wife's complaints.Thanks for your time Chirag! We love hearing from developers in our community about inspiring stories, so if you have something you'd like to share, visit our online submission form. Or better yet, come to Google I/O and tell us your story in person. All fine and dandy; But what "extra" kicks does it give to my autocomplete? We've got so many frameworks around these days that have plugins, widgets doing the same thing ... Dojo, Prototype, Scriptaculous, JQuery, Ext JS ... that you often wonder about those things. Can someone clarify? "You will not, and will not permit your end users or other third parties to incorporate Google Search Results as the primary content on your Property or any page on your Property"